For urban commuters, weekend warriors, and true outdoorists, few things are more disappointing than muddy boots, soggy tents, and raingear that soaks through. But ever since Greenpeace called out the dangers of perfluorinated compounds (PFCs), including PFOAs and PFOS—used in coatings and treatments that render textiles durably water-repellent—the industry has been challenged to create an environmentally-sound finish that truly performs on outdoor gear and apparel. Many of these PFC-free formulations simply could not offer the necessary level of repellency and durability. 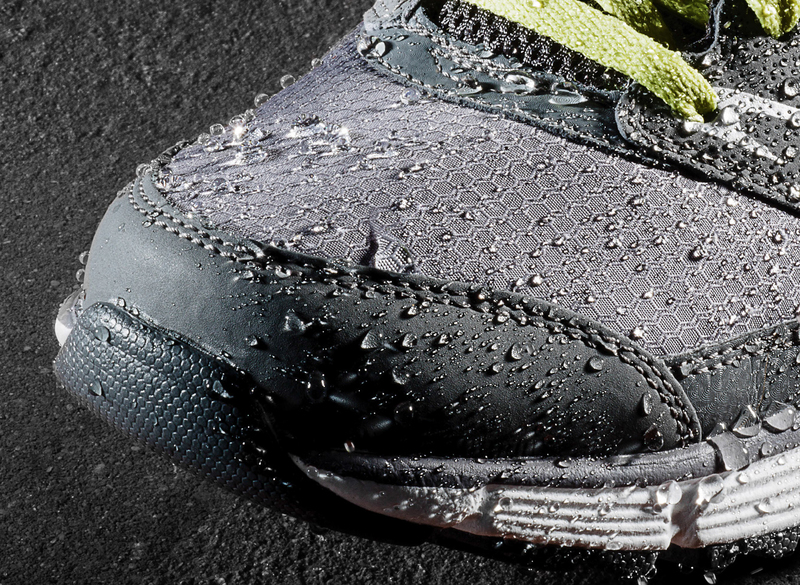 Remarkably, a new chemistry developed by NeverWet offers exceptional water repellency without the use of harmful PFCs. 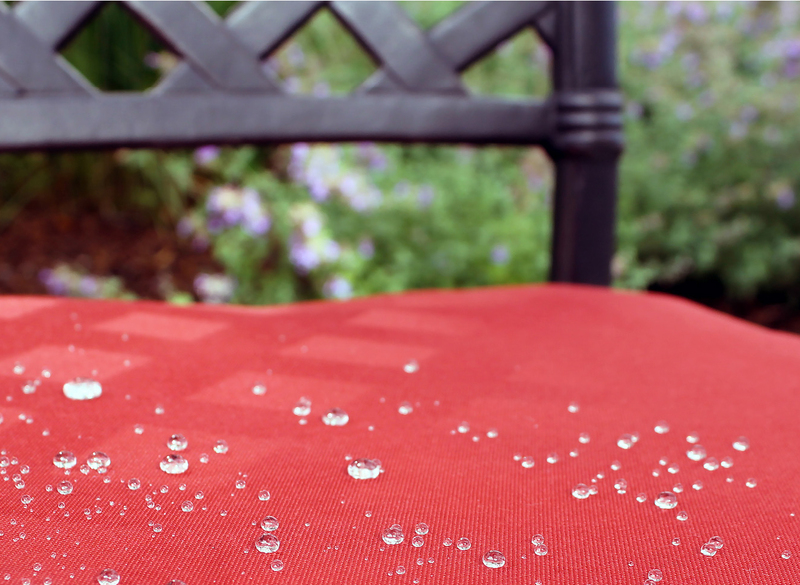 After years of developing super hydrophobic coatings for a variety of commercial, industrial, and consumer end uses, NeverWet, through their manufacturing and distribution partners at Rust-Oleum, has commercialized a PFC-free formula for textiles that dramatically repels rain, mud, ice, and other liquids, while allowing the fabric to breathe. NeverWet fabric treatments exhibit water repellency beyond other available products, keeping consumers dry and safe on the trail or on the road. And while NeverWet’s PFC-free textile finishes are not considered oleophobic, they are resistant to many stains. The performance of water-repellent coatings on most surfaces can be measured by the contact angle of a water droplet with the surface. Contact angles less than 90˚ are characteristic of hydrophilic surfaces; between 90˚ and 150˚ is the range of hydrophobicity. Droplets on surfaces treated with NeverWet exhibit a contact angle above 150˚, which means that the treated surfaces are super hydrophobic. NeverWet’s new PFC-free textile treatments meet the latest industry standards in an effort to support the demand for fluorocarbon-free finishes, yet are tough enough to stand up to nature’s worst challenges, from rain and ice to mud, dirt, and many water-borne stains. ‍Highly water repellent measuring as high as 5A on AATCC 193 range. ‍Stain-resistant against mud and common food items like coffee, Gatorade, soy sauce, vinaigrette, ketchup, red wine, soda, chocolate syrup, and honey, to name a few. ‍Washable up to 70 home launderings (AATCC 135) before loss of hydrophobicity, when using the PFC-free water-based textile treatment. ‍Durably water-repellent. Fabrics treated with solvent-based NeverWet formulation outperform the competition, resisting wetting beyond 24 hours of exposure to a more extensive version of ISO9865 Bundesmann rain test, which simulates heavy rain. 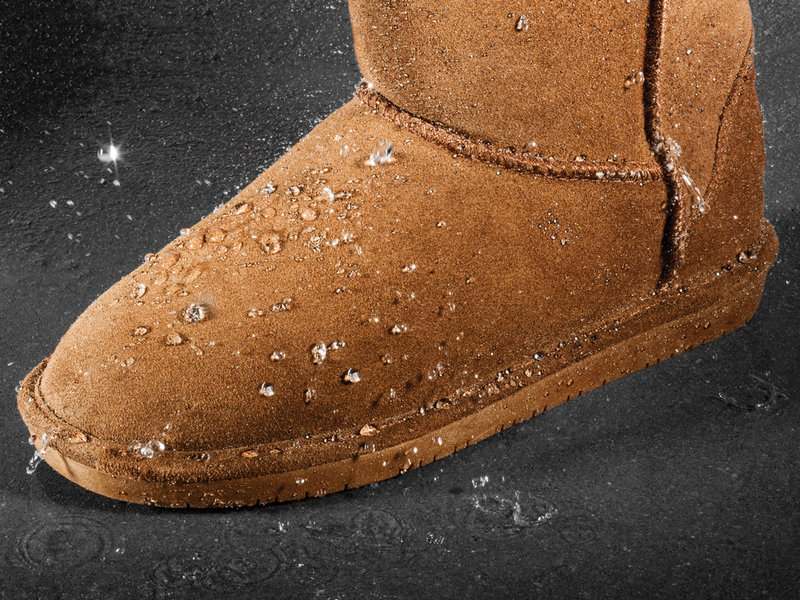 ‍Durably stain-resistant against mud. Fabrics treated with solvent-based NeverWet formulations display extreme resistance against mud stains. Muddy water fails to soil NeverWet treated fabric when shaken together vigorously in a paint shaker for hours. ‍Wear-resistant. Solvent-based NeverWet treatment continues to resist water wicking after thousands of Maeser flexer cycles (ASTM D2099) which simulate footwear fabric use. NeverWet’s latest iterations include a water-based treatment for use on textiles at the mill level and an organic solvent-based application on products at the finishing step of the manufacturing process. NeverWet’s water-based PFC-free formulation is applied as a finish at the textile mill, where it is heat-cured during the drying process. It is effective on most substrates, including polyester, nylon, poly/cotton and other blends. The chemistry bonds to the fibers, allowing the fabric to breathe and retain its aesthetics. NeverWet’s PFC-free spray treatment is ideal for use by manufacturers during production of footwear, packs, tents, and other outdoor and hunting equipment. The organic solvent delivers the water-repellent chemistry to the fibers, without affecting breathability or aesthetics of the finished product. Ambient-drying, the spray treatment is also ideal for maintaining repellency over time; and holds future potential for consumer use. NeverWet fabric treatments are unique in their ability to withstand extra-rigorous versions of dynamic shower tests beyond industry standard AATCC 22 and 42. The volume of water is increased from 100 ml to 15 – 20 liters; while the height of the shower head is raised from 24 to 72 inches. NeverWet PFC-Free textile treatments deliver environmentally friendly, durable liquid and stain repelling performance that exceeds competitive offerings. NeverWet LLC, established in 2008 and based in southeastern Pennsylvania, is an innovative company with numerous patents relating to their exclusive superhydrophobic and oleophobic technology for various consumer and industrial applications. Our focus for the immediate future is to deliver a sustainable, environmentally friendly, multi-liquid and stain resistant DWR that is effective on cottons and delivers a minimum 50 wash/dry cycle durability.